Released from their 2012 album, Overexposed..“Payphone” was one of the biggest hits of 2012, selling more than 12 million copies across the globe. With Wiz Khalifa chirping in, with a few rap verses and an action filled eye-riveting music video, “Payphone” had success written all over it, debuting at the 3rd spot in the coveted Billboard Hot 100 charts. 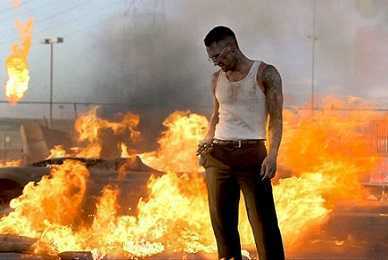 As on May 18th 2017, “Payphone” music video has more than 407 million YouTube views with 1.5 million likes.The video starts with Adam Levine (lead singer of Maroon 5) standing next to a burning car and a payphone. He picks up the payphone and starts singing through it,as he sings..things that happened earlier in the day are shown in the music video.Adam who seems to be a bank employee is sitting on his desk watching hot women pass by. A bunch of armed bank robbers storm the bank,take down the security guard, show the guns to the customers and the employees and ask them to get on the floor,this scene is very similar to the Dark Knight bank robbery scene. Adam Levine manages to hide behind a desk, while the rest of the bank employees and customers are held at the gun point by the robbers.The robbers find the vault and start stuffing the money in their travel bags. As one of the robbers drags a bag full of cash, Adam seizes the opportunity..grabs the gun from his belts,grabs the hands of a super hot female bank employee and starts running. As the other robbers shoot at him, the lady employee and Adam manage to dodge the bullets and run out of the bank through the front door. But to his absolute shock and dismay, the cops who had the bank surrounded..start shooting at him, thinking he was one of the robbers,Adam somehow doges their bullets and strolls through the busy streets of L.A along with the female employee. He then manages to steal Wiz Khalifa's super-sleek sports car, who had just handed it over to the Valet and gets on a hot pursuit with the cops.Armed Police choppers join the pursuit as Adam falls behind..in the chase. Cops then block the road with patrol cars, while those cops from behind start shooting at him. Adam then does a 360 degree turn, catches the cops by surprise..whose patrol cars crash into each other and explodes. Adam Levine then parks the super sleek sports car under a fly over, where it explodes due to excessive heat..as Wiz Khalifa looks from a distance.He then picks up the payphone and starts singing. “Payphone” peaked at the second spot in the Billboard Hot 100 charts, selling more than 5.5 million copies in the U.S.The song also went multi-platinum in Australia, Denmark, Mexico, Canada, New Zealand, U.K, Italy, Switzerland and South Korea, where it sold more than 2.4 million copies.